After a half-day cycling around the north side of the West Lake, I was like a wild child with one hundred percent passion for the afternoon’s cycling. I knew there were numerous hidden surprises waiting for me along the way. Getting a little recovery at KFC, I was excited to get on my bike heading south along Su Causeway, the 2797 meter-long causeway with green, tall, weeping willows standing along the bank of West Lake. 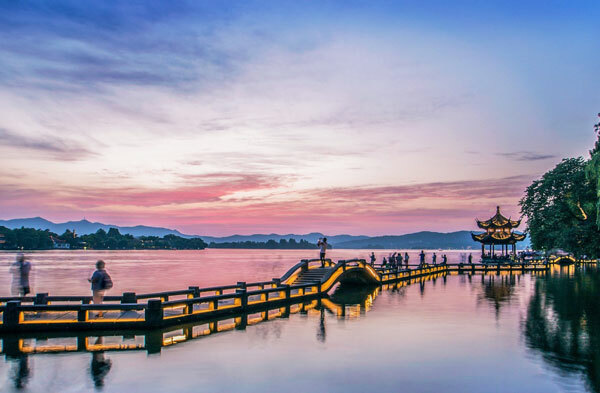 In 1090 during the northern Song Dynasty, the famous poet-governor Su Shi came to Hangzhou to dredge West Lake, make full use of the mud and build the causeway. The local people named this causeway as “Su Causeway” in memory of Su’s contribution. It is better to come in spring and get up early at dawn to catch the sunrise and morning glows to meet the most beautiful West Lake. 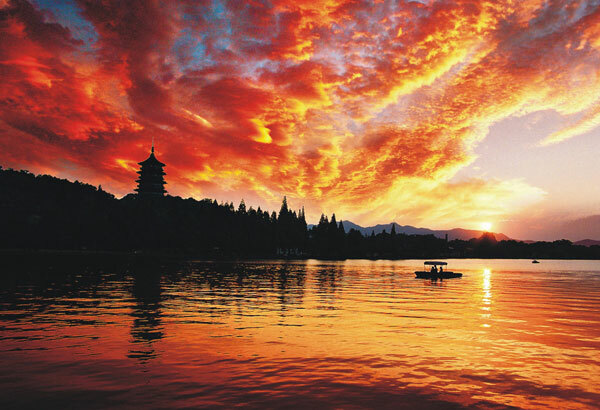 You won’t miss the famous “Dawn at the Su Causeway in Spring” (苏堤春晓) which was listed as the no.1 scene among “Ten Scenes of West Lake”. There are six old bridges built on Su Causeway, including Kuahong Bridge, Dongpu Bridge, Yadi Bridge, Wangshan Bridge, Suolan Bridge and Yinbo Bridge. When I passed Kuahong Bridge, I thought I could have a look at the “Lotus Swaying in the Breeze” (曲院风荷) at my right side in Yue Lake. However, it turned out to be a long fence standing along the road, making it nothing to be seen. 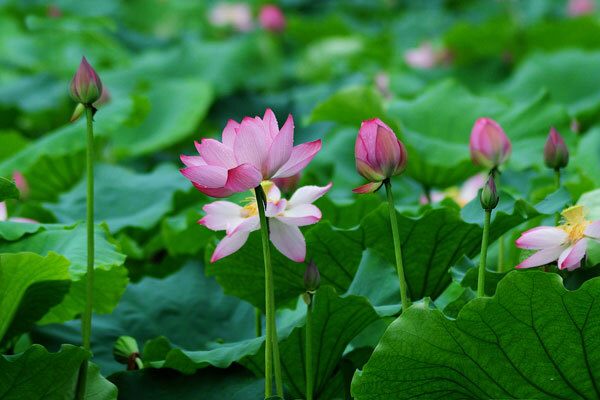 (If you don’t want to miss this scenic spot, there is a main entrance on the north side of Yue Lake to get into “Lotus Swaying in the Breeze”.) Touching scenery is everywhere. You would never get bored when visiting Su Causeway, the lovely couples leaning close on the bench, the local elder fishing along the bank, the happy families boating on the emerald lake, the young travelers riding leisurely under the romantic trees… It was so grateful that I was a member to feel the charm along this causeway. After about half an hour’s happy riding through the crowds, I arrived at the entrance gate of “Fish Viewing at the Flower Pond” (花港观鱼). There were hundreds of Chinese group travelers visiting this scenic spot and I tried to find out the reason why they choose to head to this place. 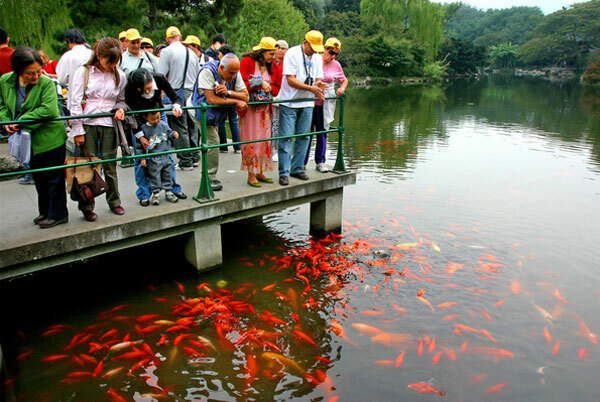 “Fish Viewing at the Flower Pond” is a large park surrounded by water and hills. 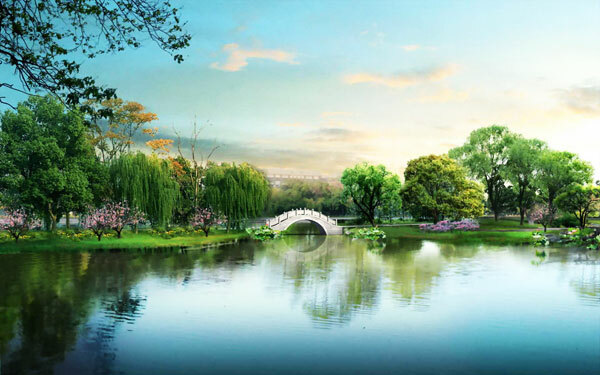 It was first named “Lu Garden” in the Southern Song Dynasty for Lu Yunsheng built villa, plant flowers and raised fish, making this garden elegant. In Qing Dynasty, when Kangxi Emperor traveled to West Lake, he ordered to build a stone tablet and inscribed “花港观鱼” personally. In fact, this garden was very large which took me about one hour to look around and I saw many red fish at Red Fish Pond, different kinds of flowers at Peony Garden, osmanthus’s fragrance blowing in the wind…It was a lively and harmonious garden which was good for taking a walk. Later, continued my cycling to Prince Bay Park where you can see many lovely young couples taking their wedding pictures. It was said that there were two princes in the Southern Song Dynasty buried here and got the name. 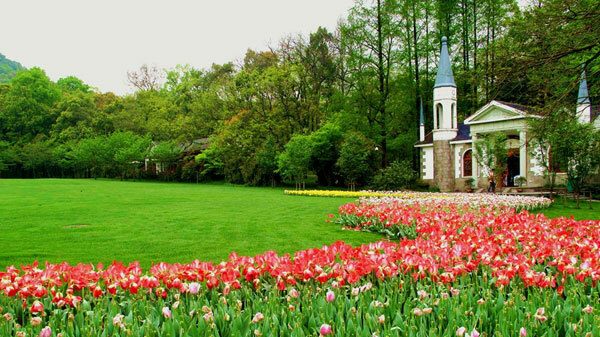 In my personal opinion, it is good to visit Prince Bay Park in spring when tulips and other kinds of flowers are blossom joyfully in this idyllic garden, turning out to be a photography paradise for anyone who like taking pictures. All of the amazing natural scenery unfolding in my mind, and an idea came out – how about doing some cultural exploration in the next few hours? 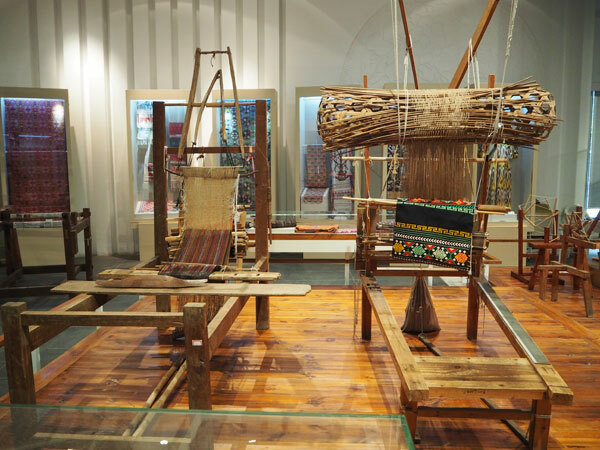 I knew many G20 Summit leaders visited China National Silk Museum for silk culture learning. Was it near West Lake? I checked its location on map, and it was so close that just two kilometers away from Nanshan Road. Waved goodbye to my three partners and I decided to visit China National Silk Museum on my own. The bicycle system in Hangzhou was very sophisticated and there was bicycle parking area for every place you visited. I parked my bike and began the magical silk culture exploration. 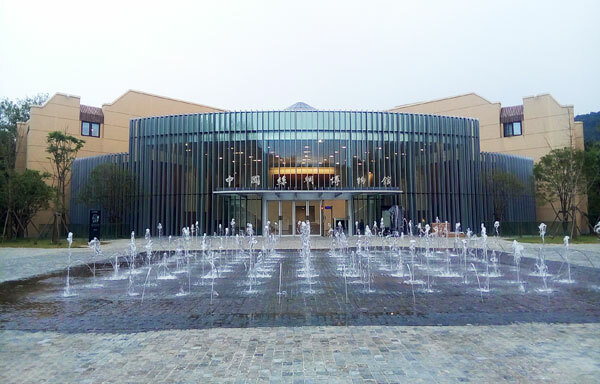 China National Silk Museum is brand new!!! 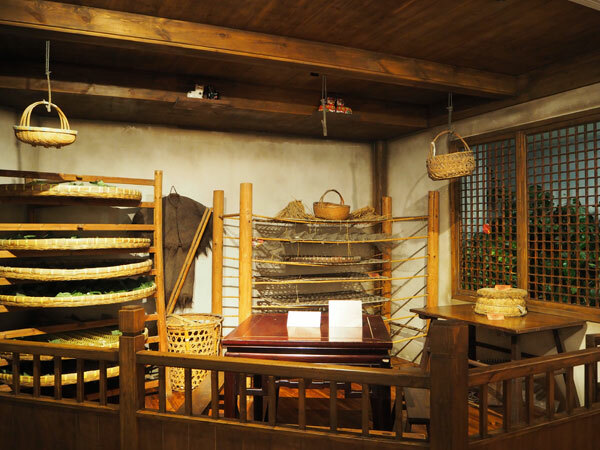 It is not only the first state-level specialized silk museum in China, but also the largest silk museum in the world at present. 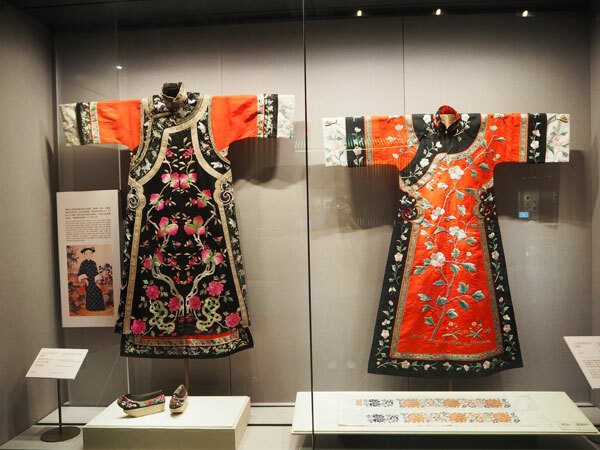 It displays about 5000 years silk history and culture which is regarded as an educational and amazing window for travelers to have a better understanding about Chinese silk and the Silk Road and have a new respect and appreciation for Chinese and Western silk art and fashion. Two hours for me was too short to have full understanding about Chinese profound silk culture in this museum. My passion about silk would never fade away!!! Time was stolen from me. I hurried to hop on my bike and tried to reach Changqiao Park before sunset. Luckily, I arrived at Shangtou Bridge around six o’clock and it was the right time to shoot “Leifeng Pagoda in the Sunset” (雷峰夕照). Many professional photographers were waiting for the change of light to capture the beautiful sunset. What impressed me most was the romantic feel when walking along the Shuangtou Bridge, well linking by Xiyin Pavilion stretching into the lake. Though I was alone at this time, I was not lonely at all. When the sunset went down slowly, when the West Lake presented its quiet side, I also calmed down with a peaceful mind. I knew no matter where I was, I would never felt lonely because I did think I was a part of nature. 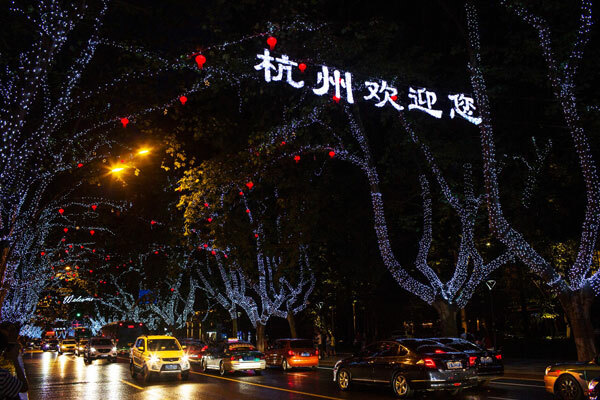 When I prepared to leave Shuangtou Bridge, I was shocked by the starry Nanshan Road which definitely a surprise to witness the dark road turning into a romantic pedestrian. Once I saw “Welcome to Hangzhou” hanging over the plane trees, I felt so warm that Hangzhou made me feel at home in its own way. With slowly riding, I arrived at the Third Park at Hubin Road. It was the right place to watch West Lake Musical Fountain at 19:00 and 20:00. BUT, it was so crowded that I even could not find a location to stay along the lake (If you arrive early, you can enter into the park to find a seat to watch the fountain show.). 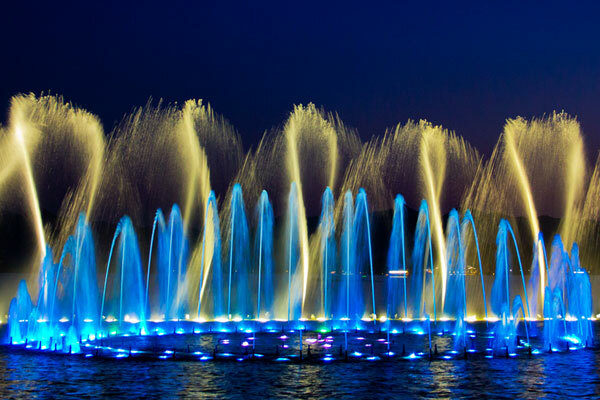 It was a pity that I just saw the musical fountain dancing on the lake without hearing any music. 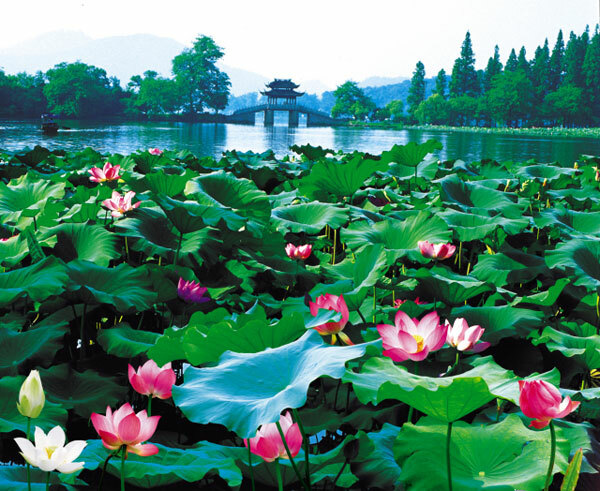 A full circling around the lake cannot express all my love to the vast, beautiful, elegant, poetic, legendary West Lake. There are so many to explore when I open my heart and follow the natural step. 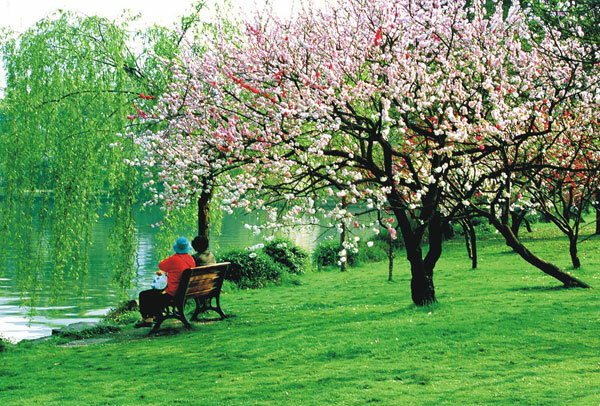 My dear travelers, what is your way to touch the beauty of West Lake in Hangzhou?